These identical twins fell pregnant simultaneously nine months ago and have now given birth. 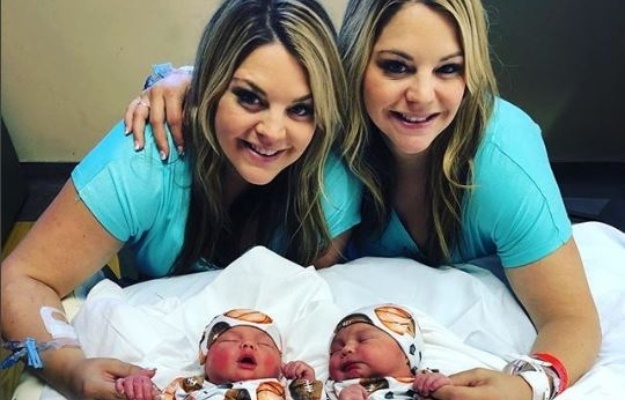 Twin sisters Jalynne Crawford and Janelle Leopoldo from Arizona in the US gave birth to healthy baby boys Bryson Ryder Crawford and Jace Alan Leopoldo on 18 June at the same hospital, and both by C-section, People reports. “Giving birth on the same day in the same hospital was like waking up on Christmas morning opening two presents at once. It was a miracle,” Janelle said in her first interview since the birth of her baby. The identical twins were given rooms right next to each other in Arizona hospital. “For the three days we were in the hospital we were in each other’s rooms all the time,” Janelle says. About nine months ago Jalynne, who found of she was pregnant four days before Janelle, received a text from her sister that she would never forget. “When I got the text my face lit up,” Jalynne said. “I got chills in my arm and then seconds later she called and we were both like, ‘Thank you, thank you God’. Although Jalynne fell pregnant easily, Janelle had a harder time trying to conceive, ABC News reports. After trying various routes to fall pregnant, Janelle opted to use in vitro fertilisation. She discovered she was pregnant four days after her sister. The twins, who lost their elder sister, Jennifer, early this year, have also suffered numerous miscarriages between them. “We said Jennifer was in heaven and would pick our babies for us,” Jalynne says. The twins told Honey News that their family are already calling the two baby cousins “twinousins”. “Our husbands joke, ‘If you marry one, you marry the other’ – in the sense that we love being together so much and talking so much,” Janelle says of the twins’ relationship.